Several types of fossils can be found on the sand and gravel bars in Spring Creek, particularly after floods expose them. Austin Chalk: Below is a photo of the fossil-bearing Bruceville Marl which runs along the Blackland Prairie south through Austin. The middle Austin Group at Spring Creek Forest is approximately 86 to 87 million years old. The composition of the calcium carbonate chalk includes the remains of small marine plankton such as foraminifera and nannoplankton such as coccolithophores. According the Texas Bureau of Economic Geology, “tan to white chalk beds are composed of partly recrystalized, fragmented nannoplankton matrix having 5 to 25 percent foraminifers and whole or fragmented inoceramid pelecypods.” Foraminiferans or “forams” can be seen in the Foram Gallery. Coccolithophore information can be found at the “Ehux” Home Page. In addition to coccoliths, other nannoplankton include nannoliths, silicoflagellates and calcispheres. The Atco Chalk (creek and banks), Bruceville Marl, and probably the Hutchins Chalk (top of exposure) are all expose along the creek. Badly weathered oysters of Exogyra ponderosa Roemer were also found loose along the banks, but I did not find any in strata. I’m not sure about the Hutchins because I didn’t see any of a distinct species called Inoceramus (Cladoceramus) undulatoplicatus (Roemer), which occurs at the top of the Bruceville Marl according to reports. 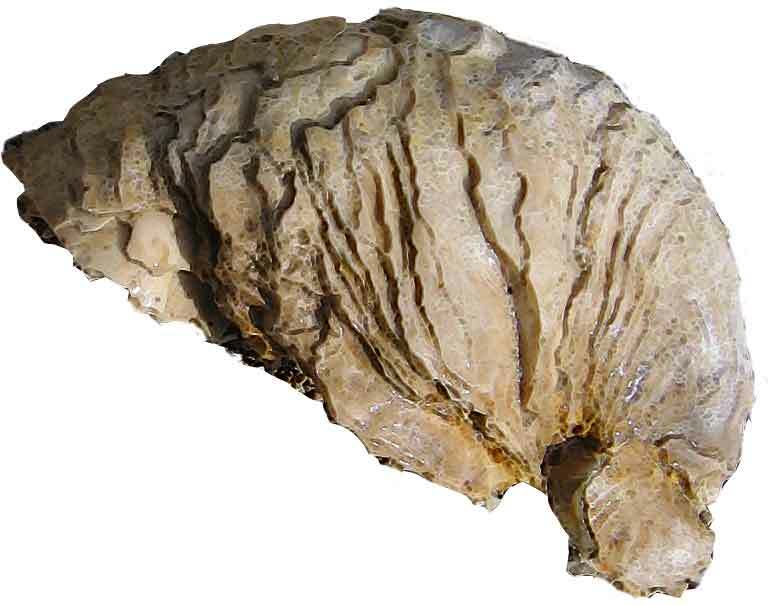 This marine bivalve, a fossil oyster, is generally found in the lower third of the Austin Chalk Group. Specimens can weigh several pounds. This one was found on Feb. 19th at Spring Creek. Recently snowmelt and stormflow apparently washed it downstream. This is the same location where the coral specimen was found three years ago. (For size comparison is the Asiatic clam, Corbicula manilensis. This small clam was originally introduced to Washington State in 1938. Since then the clam has invaded almost every watershed in the United States). Interesting to see ancient marine fossil side by side w. modern-day freshwater bivalve. RudistsIt’s a piece of a large rudist (or rudistid) Clam called Durania austinensis (Roemer, 1852). Roemer’s original figures and several additional photographed specimens in the literature corroborate the ID. Reports include: 1) the Terlingua Group, Pen Formation of West Texas, 2) the Terlingua group, top of the Boquillas Formation ( top of San Vincente Member), 3) the upper Austin Group of central and north Texas, 4) the Taylor Group, Ozan Formation, 5) the Taylor Group, Pecan Gap Chalk of central Texas (from Bell, Brewster, Fannin, McLennan, and Travis Counties). Your specimen adds Dallas County to the list (upper Austin Group). Based on the stratigraphic levels from which this rudist bivalve has been reported, it’s range extends from the at least the Santonian (and possibly as old as Coniacian) Stage to the middle Campanian Stage (~86 to 79 mya, give or take). The above photos are of encrusting oysters on an inoceramid, probably Inoceramus (Platyceramus) platinus (Logan)or fossil bivalve.. These encrusting oysters are called Pseudoperna congesta. Thanks Keith for the id’s. Top Right: The Inoceramid is Inoceramus (Cremnoceramus) crassus inconstans (Woods),. The piece below the fossil wood is a piece of calcite with slickenside grooves in it. It fills the joints between the limestone blocks. Probably what happened is that as the blocks faulted or locally settled, the gouged out grooves on either surface. Then, the calcium dissolved in the water (probably as calcium bicarbonate (Ca(HCO3)2) precipitated out as calcite (CaCO3) and filled the cracks. The piece then weathered out, showing the impression of the grooves. Fossil wood is the most common find on gravel bars in Spring Creek. Please help identify this fossil….was located at Beck Branch in Richardson Texas…..a tributary to Rowlett Creek in the same major drainage as Spring Creek. Click on thumbnail to enlarge. Photo taken 2/22/07. Specimen was in rock which had broken off the adjacent cliff face. Looks similar to Parapuzosia americana from Middle Austin Group formation. I also saw a couple of ammonite impressions, which may still be there if they haven’t eroded away. 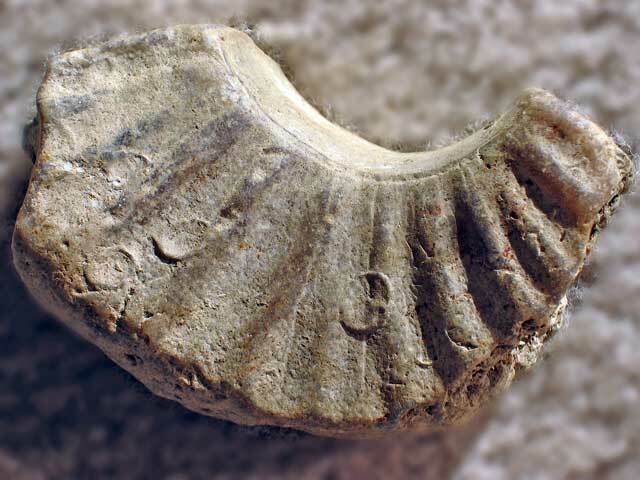 One impression I was able to refer toTexanites (Plesiotexanites) stangeri densicostatus (Spath), a strongly tuberculate, lowermost Santonian ammonite (~87 mya). I also saw another strongly tuberculate form that looked more like Texanites (Texanites) gallicus Colligon. There really wasn’t enough of it to pin a species name on it. These ammonites indicate an Early Santonian to Late Santonian age for the top of the creek exposure, and also indicate that not only is the Atco exposed there, but the Bruceville and Hutchins fms are also present. If you look at the Geologic Atlas of Texas, Dallas Sheet, these should be the main formations exposed at the creek.Photo taken July 15, 2006 on lowest formation exposed along Spring Creek close to Maple Ridge Drive. Above: April 11, 2007: Same fossil after a section split off due to recent high spring flows or possibly vandals….The internal structure is revealed. Special thanks to Keith Minor for most of the fossil identifications as well as Rocky Manning’s identification. DanaAAllen’s Flickr site showing fossils from the North Sulphur River. (Below) is a mineral, not a fossil, but still interesting…these are pyrite nodules in Austin chalk Atco Formation found in Duck Creek located sw of Spring Creek. Pyrite is the classic “Fool’s Gold”. Pyrite crystal usually forms as a cube, which can be seen if you magnify these pyrite nodules. Less commonly, it forms as octahedrons (eight-sided shapes), nodules, or massive forms. It can also occur as coarse granules. I found some fossils in the north san antonio area and I’m looking for some help identifying them. Can you help if I send you some pics? I think some are bones n teeth and claws. I’m sorry I no longer have fossil contacts for Texas…please direct your question to Barbara Baynham, President of the Society at Barbara_Baynham2005@yahoo.com. Thanks for your interest in our website!